You are here: Home / News / Black America Needs To Cease With Their Silly Criticism of Dr. Cornel West. 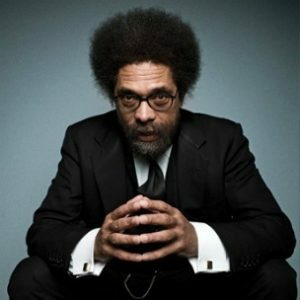 Black America Needs To Cease With Their Silly Criticism of Dr. Cornel West. (ThyBlackMan.com) I recently enjoyed an evening with Cornel West, a figure who is unquestionably the most profound cultural critic and philosopher Black America has been gifted with over the past three decades. Anyone who has either read or listened to West can attest to his expansive knowledge base and never-ending commitment to “speak truth to power”, even if that powerful figure is President Barack Hussein Obama. Many argue that the only variable more impressive than West’s knowledge is his courage to remain wedded to a Christian love ethos that facilitates his denunciation of Black Nationalism in favor of a Christian love fest that mandates that he exercise an Agape Love for all, a population that includes undesirable such as virulent bigots and white supremacists. In the world that West lives in, the Sun never sets on the Kingdom of Christ. One does not have to look far to discover Blacks who loathe both Tavis Smiley and Cornel West for their criticism of Obama. Both of these self-appointed black leaders were considered Judas-like for their public criticism of this nation’s first Black President. I personally thought that Smiley’s criticism was in a word, petty, while West’s critique was not only consistent with positions he always held regarding Capitalism and the need for political leaders to serve the people and not big business/corporations. Anyone who follows West’s incredible political acumen can attest to the fact that his chastisement of Obama was merely an extension of what he has done his entire public career; that being, calling the powerful to serve the less powerful. Unfortunately for West, the ending of President Obama’s tenure neither lessened nor ended his penchant for being a lightning rod of criticism within Black America. Ironically, the arrival of Donald Trump to the Oval Office has intensified Black America’s criticism of Cornel West. Inquiring busy-body minds throughout Black America want to know why West has remained silent regarding the new Commander-in-Chief. In the build-up for appearance, I consistently heard others chastising West for his attacks on their dear “brother” while allowing a dastardly figure like Donald Trump to escape unscathed. This dilemma reminds me of the following philosophical question. West’s critics have chosen to ignore the reality that the quickest way for a Black man to get on national television during the Obama administration was to criticize Barack or Michelle on regarding either policy or personal matters. Black America has always felt that Whites are more than willing to provide a venue for Negroes to tear down Blacks in public. There is no room to debate that during Obama’s Presidency, news stations relished the petty intra-racial in-fighting that made for great ratings and riveting political theater; Cornel West was a regular on such shows. It is the relative silence of West’s voice regarding the Trump Presidency that disturbs wide-swaths of Black America on an unconscionable level. They want to know where is his condemnation for Trump; trust me when I say that many believe if Cornel West is incapable of issuing a more scathing denunciation of Trump than he did regarding Obama, well, let’s just say, they don’t feel that he is fit to live among Black folk. The rush of many Black folk to denounce Cornel West caused them to ignore an unfortunate reality facing Black public intellectuals and political pundits. The referenced reality is that unless Black political pundits and intellectuals are invited by whites to share their perspective on a national television outlet such as CNN, MSNBC, or Fox, their voice is muted. Let me ask the philosophical question mentioned above in a different way to drive my point home. Unfortunately for West, it appears that much of the criticism spewed in his direction is far from substantive and fails to highlight notable flaws in his political perspective. Instead of substance, we have back-biting, innuendo, and unreasonableness. In the process of criticizing West, Black America has chosen to ostracize the premier philosophical mind of our time; such an unwarranted decision is unwise and unnecessary. There is no doubt that West’s prophetic voice and criticism of multiple inequalities is a crucial portion of how Black America progresses toward liberation. In many ways it is ironic that so many of our people do not possess the wisdom to recognize why a brilliant mind like West must not be ignored under any circumstances. Nam ille est bonus amicus!!! Nam ille est bonus amicus!!! Nam ille est bonus amicus!!! Nemo neget neget!!!Dr. West is a great American who is wholly representative of American intellectualism. African Americans should stop putting down the role models of what they must become in America to truly enjoy the true fruits of being an American citizen. Education is the true golden key to success.